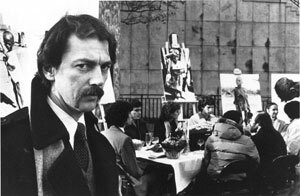 Joey Skaggs, with the help of friends and some of his students from the School of Visual Arts, created a stark portrayal of a Thanksgiving feast at the United Nations Plaza on Thanksgiving Day. There was a large banquet table complete with a turkey and all the trimmings surrounded by giant photos of starving African children. 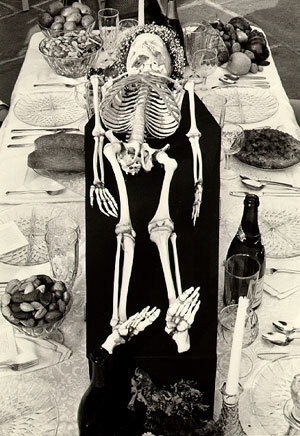 The centerpiece was a child’s articulated skeleton resting on top of the black pine coffin. 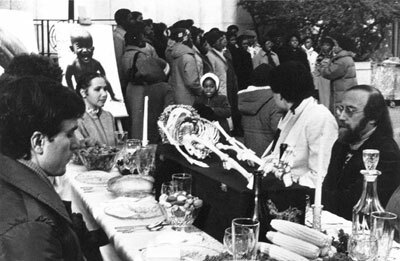 While most shoppers were counting shopping days until Christmas, the Harlem Abyssinian Baptist Choir sang, and representatives of world hunger organizations spoke about the problem of world hunger. The public was invited to join the core group of performers who sat in silent reverie around the table. No food was consumed. This was quite a contrast to what was happening across town as the Macy’s Day Thanksgiving Parade was winding down Broadway towards Herald Square. The purpose was to give a shocking portrayal of the world hunger crisis and motivate the attending representatives of the international press as well as the general public to do something about it.